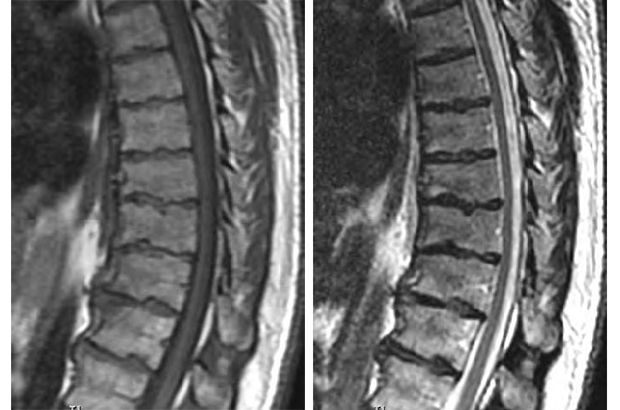 Can you guess the cause of chronic back pain in this young adult? The T1 and T2 sagittal MR images demonstrate multiple levels of endplate irregularity (Schmorl nodes), anterior wedging of contiguous vertebral bodies, and focal increased thoracic kyphosis, along with disc desiccation and height loss. This constellation of findings is known as Scheuermann disease, which is a relatively common cause of chronic back pain in adolescents and young adults. Scheuermann disease results from damage to the cartilaginous endplates in the skeletally immature spine. It is thought to be secondary to congenital weakening or repetitive trauma, which is common in young patients and athletes. The condition typically involves the thoracic spine and thoracolumbar junction. Pain is worsened by activity. The diagnosis of Scheuermann disease requires involvement of 3 contiguous levels. Diagnostic criteria include endplate irregularity or Schmorl nodes and at least 5 degrees of anterior wedging at each level. Secondary findings include limbus vertebrae, disc degeneration, scoliosis, and focal thoracic kyphosis (greater than 40 degrees is considered abnormal). Treatment is typically conservative with analgesics, activity modification, physical therapy, and occasionally bracing. Surgical intervention is rare but may be necessary in severe cases with greater than 75 degrees of kyophosis, intractable pain, or neurologic deficit. Tharin B, O'Brien WT Sr. At the Viewbox: Scheuermann disease. J Am Osteopath Coll Radiol. 2012;1(2):40. Dr. Tharin works with the Department of Diagnostic Imaging, Wilford Hall Ambulatory Surgical Center, San Antonio, TX.